An Ebola outbreak that erupted 8 May in a remote region of the Democratic Republic of the Congo (DRC) and then threatened to explode in a highly populated city appears to have been quelled. On 12 June, the last known person infected with the deadly hemorrhagic fever had recovered, twice testing negative for the virus. That started the 42-day clock for an official declaration, expected on 24 July, that the outbreak is over. The quick end to this outbreak—after 53 cases in Équateur province, 29 of which were fatal—is a striking contrast to the Ebola epidemic that devastated West Africa from 2014 to 2016, which sickened more than 28,000 people, killing 11,310. 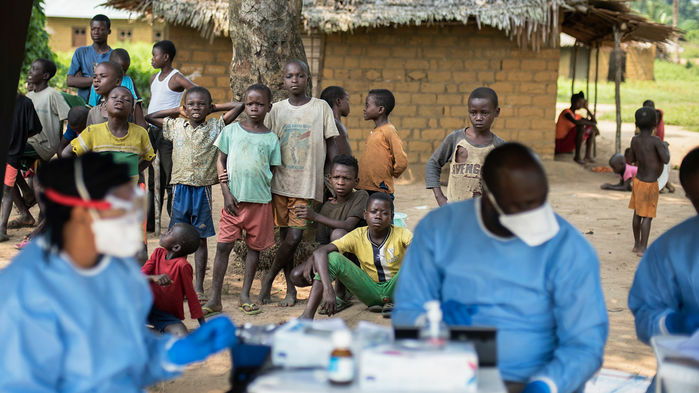 “I certainly haven’t seen an Ebola-response time frame that looks this compressed,” says epidemiologist Peter Salama, who heads the Health Emergencies Programme at the World Health Organization (WHO) in Geneva, Switzerland, and led the agency’s DRC response. Much of the credit goes to unusually rapid and vigorous surveillance, contact tracing, containment, and public education efforts by the DRC, WHO, and other international partners, Salama says. “Some of the most important lessons from the West African epidemic were truly learned.” But a new factor played an unknown, and perhaps important, role: an experimental vaccine, used for the first time early in an outbreak. No one can say for sure that the vaccine—tested during the waning days of the West African epidemic—actually protected against infection. But DRC Minister of Health Oly Ilunga Kalenga calls the vaccination program a “game changer,” as it clearly boosted morale and encouraged other public health efforts. Like the DRC’s eight earlier Ebola outbreaks, this one mainly hit remote villages. Each previous outbreak was controlled before growing into a full-scale epidemic—the largest had 318 cases. This time, the four confirmed cases in Mbandaka, a city of 1.2 million people on the Congo River, raised fears of an urban epidemic and wider spread. Donors quickly committed more than $50 million in aid, Salama says, and the United Nations provided badly need air transportation to hard-to-reach areas. On 21 May, officials launched a vaccine trial with no untreated group as a control. Workers gave shots in four different locations to about 3300 people who had come in direct or secondhand contact with a confirmed case. Although analyses still are underway, Salama says none of the 53 cases occurred in a vaccinated person. Epidemiologist Emile Okitolonda, dean of the University of Kinshasa School of Public Health, says the vaccine campaign also had tangential benefits in educating the public, a cornerstone of the traditional containment response to Ebola outbreaks. “Just the fact that all the contacts we vaccinated were informed and made aware of the urgency of the situation made a difference,” says Okitolonda, who advises the Ministry of Public Health. Boum, who is based in Yaoundé, helped run a controlled study of the vaccine in Guinea in 2015, at the tail end of the West African epidemic, that found no infections in the thousands of people who received it. Merck, which makes the vaccine—a harmless livestock virus engineered to carry a gene for the Ebolavirus surface protein—plans to file for regulatory approval next year; that would allow routine use of the vaccine outside of cumbersome clinical trials. The current study may not influence the licensing decision, but no downsides surfaced, says Seth Berkley, who heads Gavi, the Vaccine Alliance, a Geneva-based nonprofit that has paid Merck to build a vaccine stockpile and helped fund the current study. “We’ve added a real field experience and there were not any significant adverse events,” he says. More data could come from a study by epidemiologist Anne Rimoin of the University of California, Los Angeles, and Congolese researchers. To track the magnitude and duration of immune responses triggered by the shots, the team has taken blood samples from some 1000 vaccinated people and will continue to test them for at least a year. Comparing their immune responses with those of unvaccinated people could reveal signs that the vaccine provoked a protective response. “Transmission is always going to be halted using a variety of methods, and we hope to see this vaccine played a role as well,” says Rimoin, who has worked in the DRC for 15 years.